I spent the day today at back down in my old stomping ground of Nottingham. 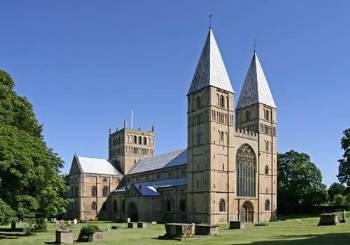 I went to a licensing service for Lay Reader’s at Southwell Minster. My good friend and sister in Christ Barbara Parish has been studying for what seems like ages to be able to act as a Lay reader in her church (and my old one!) of St Gile’s in West Bridgford and today she, along with around 20 others, were licensed as Diocesan Lay readers. It was a wonderful Service, very well attended and it was great to see a good few people from St Gile’s there to support Barbara. Bishop Cassidy was there MC’ing and he gave a very good sermon which included a well placed joke about a Mother Superior (but I wont spoil it for you!). As I watched the service I reflected on how Barbara had changed during her study years, how she had matured, evolved and morphed into a confident, theologically aware, concise and yet explorative Christian. I looked at the wide selection of people who were being licensed and I felt proud to be part of a church that has such a vibrant range of people, that embraces difference and that encourages faith through engagement and questioning. I do not have much good to say about the CofE of late but, the ministry of Lay Readership is a bedrock of the development, maintenance and growth of any church and of course, it is a very very old office. I also bumped into Andy Atkins (who is now a proud father!) who attended the same Cursillo weekend (#54) as myself and Barbara. It’s amazing how many people you see at one of these functions whom you know – a small world, very small. After the service, we retired to Barbara’s house in West Bridgford and had lunch with about 6 of her supporters and after they had gone, we three (Barbara, Zdena and me) sat and had one of our chats that we always seem to have. The thing is (and I am sure you have this with someone too) that whenever we catch up it’s like we can pick up a conversation where we left of 6 months ago. So we just chin-wagged about the life of a church, what makes a good church and how tradition can sometimes (most times?) be a restriction on organic and natural expansion/contraction. Then we talked about a book that has been getting a LOT of coverage lately…The Shack by William P Young. Now I have not read the book but Barbara and her mother both have and, along with their house-group and they considered it to be “revelatory” (my word but it kind of sums up their feeling). The expressed sentiment is that it is “Theologically Sound” and “deepens your understanding of God’s love”. I must admit to having heard a review of the book on Way Of The Master Radio so this may have tempered or clouded my views a little but, Barbara and Zdena both attested to it’s impact. I am interested to see what the fuss is about but do not think I will buy a copy, maybe borrow one ;). I will admit to being perturbed by Barbara’s statement that it was supposed that The Shack is the modern equivalent to Pilgrim’s Progress and I was well taken aback by the seemingly irreverent narrative descriptions of the Trinity, Jesus and God as a woman. For the record, God is referred to as He in my NKJV, Jesus was a man, God is a He and The Holy Spirit is without a gender descriptive as far as I know. So for me, and it may be sexist but God, is a He. Any argument or discussion about this belies a deeper insecurity. If God was depicted as a woman, I would not have a problem with it but HE is not. End of. On a final note, had a great chat with Mary Smith who is a Church Army officer and who studied at Wilson Carlisle College in Sheffield (a very cool college!) and she gave me a heads up as to what is going on there. I had always been attracted to WCC and would dearly love to be in full time training/ministry work that allowed me to study there or with them at a distance. That’s the trouble with catching up with old friends, you realise all the things you thought you were over were simply buried…. Anyhow, it was a long day but well worth the Carbon Footprint and time spent travelling, besides it meant my wife could work and my daughter to go bowling then hang out at a friends.